Features We Love about the LeapPad3 + GIVEAWAY! All of my 3 kids have grown up on LeapFrog products. The 2 boys had their Leapsters since 2010 - and they're still working by the way! Ale had played with the plane-shaped Magnetic Word Builder which is still stuck on our refrigerator door. Then she progressed to the LeapBand Activity Tracker and LeapFrog LeapTV games console, both of which remains her current faves. But I highly suspect all of that will change, with the introduction of the LeapPad3 Learning Tablet in the household! 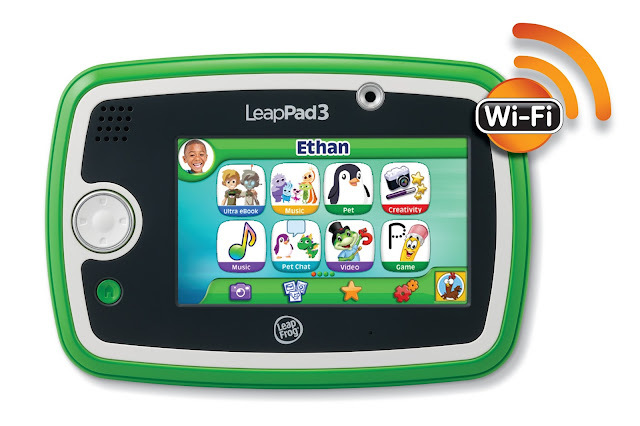 The new LeapPad3 builds on the success of the previous versions of LeapPads, which had won multiple toy awards and were bestsellers. The LeapPad3 differs from normal tablets – such as the iPad or Androids – as they are built specially for kids. Leapfrog recommends them for children aged 3-9 but I think 3-7 is a more realistic age range, given that older kids may find the games a tad childish. But no such problems for Ale for sure, who could not wait to unbox the LeapPad3! For Ale, the best part of the LeapPad3 is the ability to independently interact with the tablet and its applications. She cannot exactly read full sentences yet, but the LeapPad3's intuitiveness and use of picture labels make it extremely easy for her to navigate. For eager (read: impatient) kids who cannot wait to get started, the amount of time (and effort) it takes to set up a particular electronic device matters. A LOT. For the LeapPad3, all it took was 5 minutes for me to to register Ale's age, pick a free learning app and make decisions on WiFi capabilities. What a total breeze. Up to three profiles can be saved so that one LeapPad can be used by more than one child – although I think any child would be reluctant to share after playing with it! But what this means is that children of different ages will have the apps and games set to their age-specific capabilities. Unlike your screen-shattering iPad or Android tablets, the LeapPad3 is built to handle ALL kinds of abuse a child can dish out. It has a solid casing with impact zones, a shatter-proof screen and feels really solid to hold. Speaking of holding, the LeapPad3 is perfect for small hands and for placing on a toddler's lap. The screen is 5 inches, and is not too heavy (just under 400g) for the little ones as well. A crayon-sized stylus comes included, which slides in easily on the back and is attached with a drable string. The tip of the stylus is meshed, so kids will not be able to damage the screen by accidentally smashing the stylus against it. The older LeapPads needed FOUR AA batteries each, which proved to be quite the hassle especially when the kids brought them along during holidays - imagine all the extra weight the batteries contributed to the luggage weight! But the LeapPad3 comes with a built-in lithium ion battery, together with a USB cable and charger. I tested, and it lasted a full 6.5 hours on one single charge. Pretty impressive, and more than enough to take along on a road trip! One of the key safety features I love about the LeapPad3 is LeapSearch, a safe internet browser for kids. It is very much a closed environment of pre-approved YouTube videos and site content, hence removing the element of parental worry of kids stumbling onto undesirable content while surfing on other form of tablets. The tablets comes with both front and back cameras. Perfect for the little photographers and that selfie moment. The LeapPad3 comes with ten free apps, five of which are pretty basic: Calendar, Calculator, Notepad, Clock, and Voice Memo. The remaining apps include Music Player with 10 learning songs, Pet Pad Party and Pet Chat for peer-to-peer play over nearby Wi-Fi-enabled LeapFrog devices and Photo Fun which allows kids to customise and edit their photos with funny masks, blend photos, and apply filters. As for the remaining app, you get to free app download of your choice when first setting up the LeapPad3. Something that I have come to expect from all Leapfrog games is that every game has been developed with educational experts specifically for the target age range, and includes elements to help the young ones learn about subjects including Maths, English and Science while playing. So even though there are plenty of Disney-themed games (including the dreaded, I mean wonderful Disney Princess game), each one is geared towards various educational goals. If you are looking to give your young kids an educational tablet to enjoy within a safe system, the LeapPad3 is a solid choice. With its size and capabilities designed specifically for aged 3-9, LeapFrog's latest tablet alternative encourages quality, high-tech play in a closed environment. Thanks to Leapfrog Singapore, I have ONE set of LeapPad3 (Green) to give away! And it comes bundled with 2 Explorer Software Cartridges too, with a total value of close to $270! 1. LIKE Leapfrog Singapore's Facebook Page HERE. 2. Answer this question: Name one feature of the new LeapPad3. 3. Leave your answer either in the comment section of this blog post OR on our Cheekiemonkies' Facebook corresponding post HERE. Giveaway ends on 8 June 2015, 2359 hours. CONGRATULATIONS to TOH LAYHOON! You have won ONE LeapPad3 (Green), which comes bundled with 2 Explorer Software Cartridges! Please email me at kelvin@cheekiemonkie.net for details of prize collection by the end of 11 June 2015. Thanks! The LeapPad3 retails for S$199.90 and comes in 2 colours, Green and Pink. Each Explorer Software cartridges costs S$34.90 each. They are available at Takashimaya, Robinsons, Metro, Motherswork, OG, Isetan, ELC as well as Lazada.sg. Keep updated with Leapfrog Singapore's promotions and offers by following its Facebook page. One of the new features - LeapPad3 comes with a built-in lithium ion battery, together with a USB cable and charger. The feature is Multiple profiles which I like because I got 3 monsters so just nice for them!!! 100% kids-safe web - LeapSearch! I love the Safe Browsing feature of the LeapPad3! The LeapSearch gives me a peace of mind when allowing my kids usage of the LeapPad. It has multiple profiles! After dd use can pass down to mm! Yay! One of the key safety features I love about the LeapPad3 is LeapSearch, a safe internet browser for kids. LeapPad3 comes with a built-in lithium ion battery, together with a USB cable and charger. LeapSearch - web browsing that is safe for kids. The LeapPad3 comes with a built-in lithium ion battery, together with a USB cable and charger. The feature is Multiple profiles . as kid can set their profiles and take turn to play . is good to and also train them to share thing. Love it that it's designed for small hands and for placing on a toddler's lap. Not too heavy too! One of the new feature is the built in lithium ion battery , together with a USB cable and charger. LeapSearch - safe internet browsing for kids! It's perfect for my boys!